The aptly-named Mega Cavern is an old limestone mine in Louisville, Kentucky. It stretches out underneath the city, even under the Interstate 264 and the Louisville Zoo, and is technically classed as the biggest building in the entire state of Kentucky. A hugely popular tourist spot, visitors can enjoy tram rides, mountain biking, ropes course, and zip lines. Due to the fact that all of these activities take place underground, they’re unlike anything else you’ve ever experienced, with the zip line course proving particularly popular. The cave measures up at an astonishing 4,000,000 square feet in total and Mega Cavern zip lines offer some truly unparalleled views. While the vast majority of zip line courses are located above ground, offering scenic views of forests, lakes, mountains, and oceans, this zip line experience is thoroughly unique. Located 100% below the Earth's surface, the Mega Cavern zip lines provide guests with a fascinating new way to experience this incredible structure. Led by trained, experienced tour guides, zip line tours in the Mega Cavern last for up to two and a half hours in total and feature six thrilling zip lines overall. One of the best things about taking a zip line tour in the Mega Cavern is that it's such a unique, visually impressive structure. Differently colored lights illuminate the various underground passages, providing a truly special backdrop to your zip line flights, and the friendly guides provide truly fascinating information about the cavern. The Mega Cavern has a very interesting history, having being used as a limestone mine back in the 20th century and then transformed into a storage facility and business park over the course of the 1990s. The zip line tour guides know every little nook and cranny of the Mega Cavern and can tell you the full story of this magnificent structure. As well as six zip lines, the Mega Cavern Mega Zips tour also includes two challenge bridges to walk across and a dual zip line to race alongside friends or family members. There's nothing quite like this zip line course and it's actually the only zip line tour in the world to be located entirely underground, as well as being the top rated attraction in all of Louisville according to online tourist hub Trip Advisor. 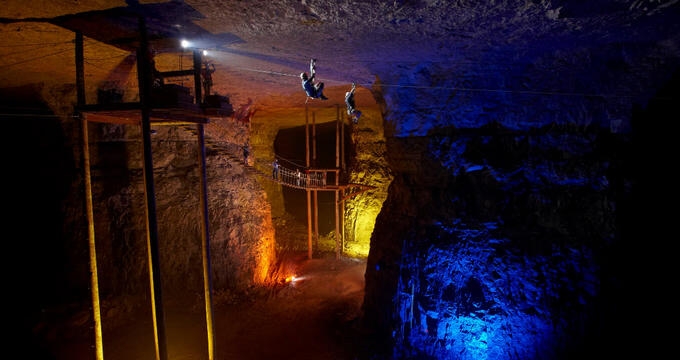 Riders of the Mega Zips zip lines can enjoy all the excitement of being up to 165 feet underground while zipping up to 70 feet above the floor of the cavern itself. It’s a special experience, but there are some important rules and regulations to bear in mind before booking a trip and setting out when the big day finally comes. The minimum age requirement for all riders is 7 years old. This is for safety reasons, as the harnesses used are designed to support people of certain heights and weights. Speaking of weights, all guests also need to weigh a minimum of 55 pounds and a maximum of 285 pounds. All guests will be weighed before taking the tour to ensure that everyone is as safe as possible. Any riders under the age of 15 need to be accompanied by a parent or guardian at all times, but riders aged between 16 and 17 can enjoy the zip lines by themselves. All participants will also need to sign a waiver before taking part and riders aged under 18 will need this form to be signed by a parent. The zip line tours are fully safe but do require a certain level of physical fitness and dexterity in order to get around and manipulate the braking system, so guests with mobility issues or heart conditions cannot take the tours. When it comes time to choose your outfit for the Mega Zips zip line tours, it's vital to avoid wearing any loose-fitting items or footwear. Comfortable, close-toed shoes are a must and it's important to remember that the tour takes place in a cave environment with hard surfaces and quite a chilly atmosphere, so remember to wrap up with a jacket or sweater, even in summer. People with long hair will be asked to tie it up and women should avoid wearing skirts. You'll also need to consider leaving valuables at home or at least bringing along a secure bag to keep them safe on your person at all times.